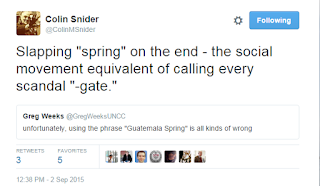 Two Weeks Notice: A Latin American Politics Blog: No Guatemalan Spring? The news that the Guatemalan legislature voted to remove President Otto Pérez Molina's immunity from prosecution is huge. The move puts even more pressure on him to resign in the short term, though if he chooses not to this could be a protracted process. It's hard to see rapid transformation in any Central American country. I'd say the best case scenario is that presidents gradually come to understand that corruption will be prosecuted, that the international community continue to play a constructive role, and that Central American elected officials slowly demonstrate why citizens should trust them. If Otto Pérez Molina actually resigns or is otherwise democratically removed before his term is over, it'll be historic. But I am not sure it'll mean long-term change, which is a lot harder and requires chipping away at an oligarchy that will not give up easily. Resignation doesn't mean the end of corruption. In Brazil, President Fernando Collor de Mello faced impeachment for corruption and resigned in 1992. Now he's a senator and another president is under fire and facing protests for corruption. Granted, Guatemala has CICIG, but this is not an overnight process. The oligarchy remains. Even if OPM is forced out, it's hard to see radical transformation. The current VP, Alejandro Maldonado Aguirre, is no radical--he helped overturn the Efraín Ríos Montt conviction. How does a change in president help the poor and/or indigenous? Other Central American countries have seen presidents in jail and there was no transformation. Political structures don't change. Unlike Middle Eastern cases, the problem in Guatemala is not elections, which have been held with alternation of power (and with Alvaro Colom at least some measure of ideological shift as well). It's that elections don't change the undemocratic status quo much. Even if we call it a "spring," that's not necessarily the same as democratization. Just look at Egypt, where the military did not stay out of power long. Would Guatemalan military leaders accept rapid, democratic change? Believe me, I want to be wrong. If OPM were to resign because of real legislative and popular pressure, I want it to represent a major step toward liberal democracy (that is, not simply the bare mechanics of procedural democracy). I fear that although it would be historic, it would also raise expectations unreasonably high. 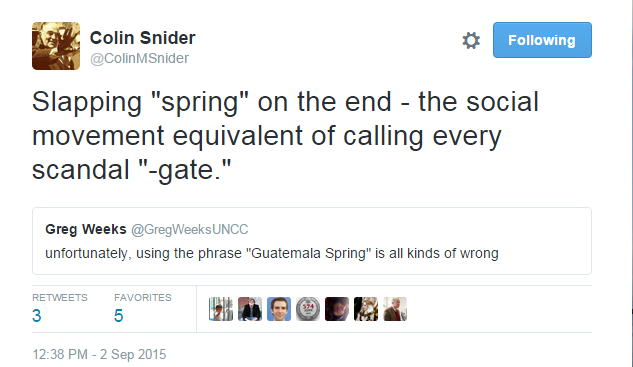 Colin Snider did a nice job of summing up my sense of the "spring" label on Twitter. I think this is true. And incidentally, the original "gate" resulted in Richard Nixon resigning but U.S. presidents became ever more secretive.